Novel, started by end of the 80ies in French, in April 2000 published first in Spanish and Castilian in South-Americy. The German version appeared in February 2001, the English version in October 2002. “Why are you still here?” is the question Irina is asked by her French girl friend Sylvie in 1989 after the peaceful revolution in Czechia. Why doesn`t Irina turn back to her country? On her way back to Prague she is tormented by questions about her native country. After 20 years of emigration Irena und Josef return to the Czek Republic, he had emigrated to Denmark. At the airport they meet each other by chance. It has been long since they`ve become acquainted - without really falling in love. They realize the sad truth: Neither can their interrupted history start again, nor does the “Great Comeback” or reconciliation with that part of them which stayed in Prague take place as they expected it. That is where arises the parallel with the classical Odyssey. When Ulysses comes back after 20 years, the Ithakans kept indeed the memory of him, yet without the slightest shade of nostalgy. Meanwhile Ulysses perished himself with a nostalgy which is nothing else but the pain of mutual ignorance. Cut off from 20 years of life, from a part of herself, Irina recognizes that nobody takes care of her odyssey. Nothing is like it has been in Prague. 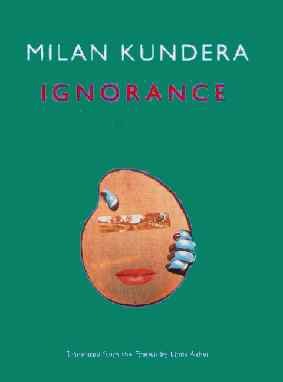 Themes of the new novel of Milan Kundera are emigration (a word which Kundera prefers to ‘exile’), absence, memory, forgetting, nostalgy, indifference, seniority, the fragility of presence. Tragedy can be sensed on each page of the novel. Ignorance is that her friend Sylvie doesn`t understand that she feels at home in France, ignorance is also that Irina and Josef have wrong expectations while travelling to Czechia.